The DemoSat design is based on the demonstration payload originally planned for the Delta 4 First Flight. The First Flight Simulator was not used in favor of deploying the Eutelsat W5 spacecraft. 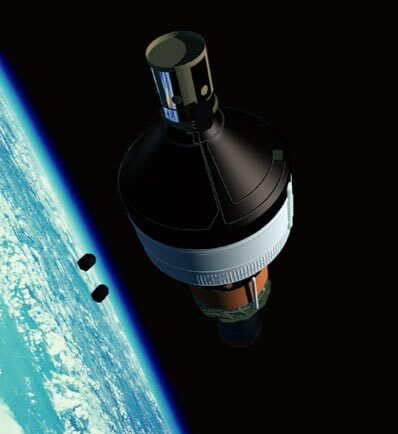 DemoSat was designed to emulate as closely as possible the typical mass, center of gravity, frequency and stiffness characteristics of an operational spacecraft. It was built for Boeing by Process Fab, Inc., of Santa Fe Springs, CA. DemoSat is a cylindrical structure 1.95 meters (76.6 inches) tall, 1.38 meters (54.5 inches) in diameter, and weighs 6020 kg (13,383 lb). The outer skin is an aluminum structure, with inner ballast consisting of sixty 4.5" in diameter brass rods. Stiffeners, plates, fasteners and fittings complete the payload. The construction of DemoSat had to meet two major criteria. First, it had to achieve specific mass and center of gravity requirements; second, it had to completely burn in the upper atmosphere upon re-entry. The use of individual brass rods was key in meeting both criteria. The overall height of the brass rods was selected to meet mass and CG requirements specified by design engineers, while the use of brass and aluminum materials facilities re-entry destruction. The design of the DemoSat payload is very robust, as demonstrated by the late addition of the DoD Space Test Program's Nanosat-2 secondary payload to the mission. Nanosat-2 was manifested on the Heavy Demo launch late in the mission integration process, long after the DemoSat had been designed and built. To quickly integrate Nanosat-2, it was determined that Nanosat-2 could be attached laterally to DemoSat. Therefore, a single circular saddle bracket was designed and attached to DemoSat, approximately 508 millimeters (20 inches) from the aft end. To this bracket was attached a flat plate tht will interface directly with the two individual separation payloads that make up Nanosat-2. The Nanosat-2 mission features two satellites built by the Three Corner Sat team (3CS), a group of students and faculty from Arizona State University, New Mexico State University and the University of Colorado at Boulder. These satellites will be used to demonstrate technologies required for small satellite constellations, including imaging, micropropulsion and intersatellite communications. The Nanosat-2 mission will also demonstrate two different low shock separation systems. Developed by Planetary Systems Inc. and Starsys Research Corp., these separation systems promise to elimination the adverse pyrotechnic shock associated with typical satellite deployments. With low-shock separation systems, the potential for damage to the satellite is reduced. These separation systems are also safer, and are therefore more conducive to testing than typical pyrotechnic devices. But technology is only part of the story for the Nanosat-2 mission: by allowing students a chance to build actual flight hardware, this program has helped to train and inspire future workers, an invaluable resource for the U.S. aerospace industry. Nanosat-2 was developed as part of the University Nanosat Program with funding from the Air Force Research Laboratory (AFRL). The Defense Advanced Research Projects Agency (DARPA), the Air Force Office of Scientific Research (AFOSR) and the Air Force Space and Missile Command's Space Test Program (STP).